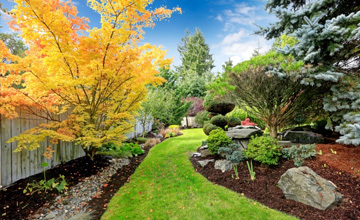 Beautify your trees, and regain the view you used to have of your landscape! Healthy looking trees add value to your property! Tree topping is a practice used with some trees to help to promote proper plant growth, safety and to maintain their beauty. Old dead branches can be a hazard to your home, or even injure a passerby. Don’t let your trees overgrow powerlines, lights, paths, or any other object in your landscape. By taking off the top of the tree, we can reduce the amount of shade the tree gives, providing you opportunities you don’t have in the shade of a large tree. Plants underneath your tree will begin to thrive in sunlight, lawns will flourish again. Remember, poor pruning weakens branches and causes cuts to heal more slowly and can leave the tree susceptible to disease and damage. Proper tree care comes with the experience we have at JRP Services. Our tree service experts have topped trees professionally for years, and the tree services we offer are designed to bring your tree to optimal health. And don’t forget, we take care of any rubbish removal, so we’ll clean up your tree branches once we’re done with the job. We also take care of pruning, if you’d like to maintain your whole landscape in one fell swoop! Check out our other tree services as well! When you need the help of an experienced tree trimming specialist in Houston, JRP Services is the only call you need to make: 281-820-3915.